Tarek Chemaly: Burger King post-Easter offer - without the lent bit. Burger King post-Easter offer - without the lent bit. 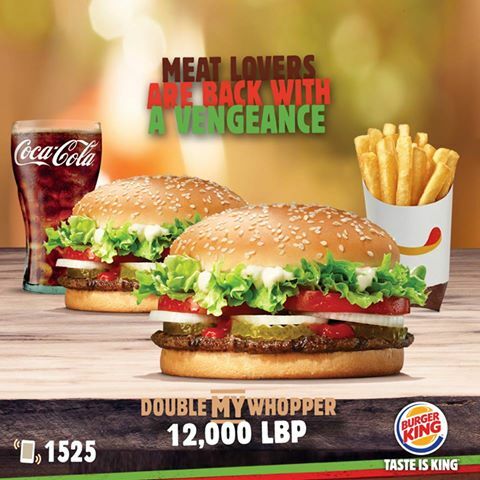 "Meat lovers are back with a vengeance" - so says Burger King in its new offer. So far nothing to write home about except for the bit where - just like McDonald's - Burger King is refusing to mention lent. You see it is customary for certain people to abstain from "red meat" during lent (which drives the surge of fish meal offers from the fast food giants in the Lebanese Market) so "back with a vengeance" is actually a wink to people who had observed the abstaining during lent, without mentioning it. It still baffles me why fast food two biggest entities have an issue with that - no matter what religion you are no one is going to deny you a Ramadan offer, so why not mention lent as it?